Hello all you Recipe Critic lovers! Mandy here, from Baking with Blondie. I’m all about food, all the time over there. My recipes range from the sinfully sweet, to the perfectly healthy. I could probably eat an entire pile of guacamole with an endless bowl of tortilla chips, and my favorite thing to do (besides baking & cooking the day away) is to lace up my running shoes, and trot along to Michael Jackson and Sara Bareilles in the wee hours of the morning. I can’t even begin to start raving about how excited I am to be able to share a little bit of my kitchen with you today. Alyssa is such a doll, and I am constantly inspired by her diligence in bringing you such a wide range of fabulous recipes. In attempt to throw one of my dishes in the ring, I bring you something that’s not only beautifully simple, but right in season with what’s flowing from your gardens this month. If you don’t have a garden to pick from, no need to worry. The beautiful produce of this harvest season is most likely available for a great price at your supermarket or local farmer’s market. Take advantage! These flavors can be used in so many beautiful ways. Today I’m sharing with you my new favorite pick. Campanelle is one of my favorite pastas. The signature bell shape has a clever way of trapping in whatever sauce it’s doused in, or surrounded by. In this case, the plate has been adorned in a simple dressing, made purely from boiled garlic, bursting cherry tomatoes, fresh basil leaves, a little salt & pepper, and extra virgin olive oil. 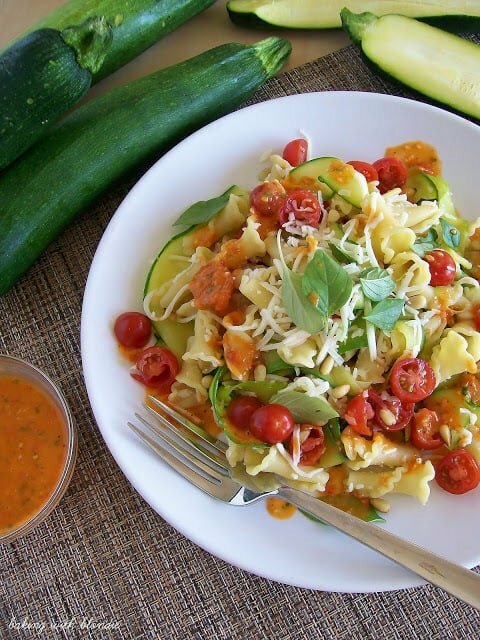 The sauce blends almost seamlessly with the major produce most likely bursting from your gardens: zucchini and tomatoes. To add a little crunch and a hint of nuttiness, I added toasted pine nuts. And what would a pasta be without a little cheese? Mozzarella took the stage, and provided such a mouth-watering creaminess to the overall dish. It was the perfect way to end these final precious summer days! 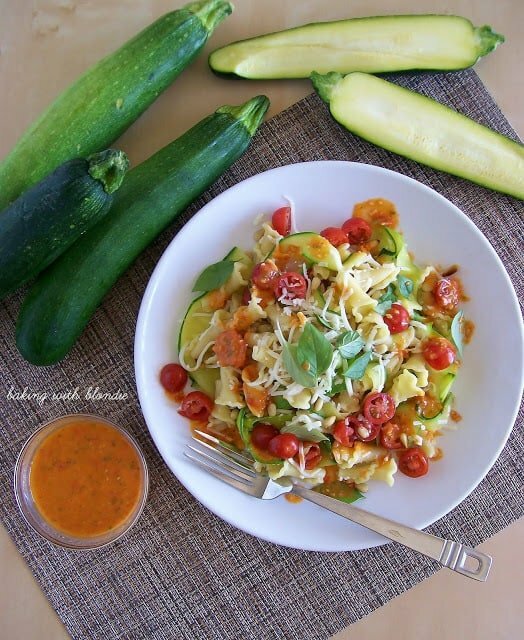 A delicious salad made with fresh garden ingredients and a fresh tomato basil dressing on top! Make the dressing: Bring a small saucepan of water to a boil, add the garlic and cook 2 minutes (strange, but true). Remove the garlic with a fine mesh sieve and place in a mini food processor with the cherry tomatoes, vinegar and basil. Puree until smooth. Add in the olive oil and blend until smooth. Season with salt and pepper. Make the salad: Bring a large pot of salted water to a boil. Add the pasta and cook until al dente. In the last 2 minutes of the pasta boiling, add in the zucchini ribbons. 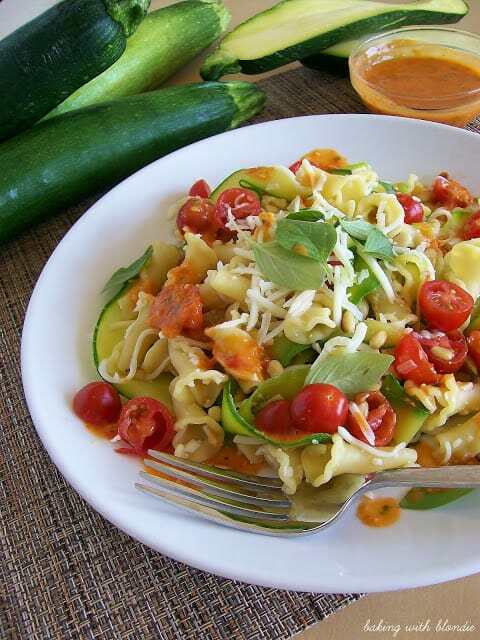 After, drain zucchini and pasta in a colander, and rinse under cold water Shake of the excess, then transfer to a bowl and toss with the dressing. 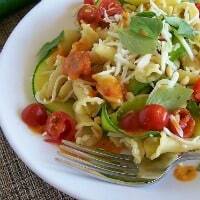 Add tomatoes, mozzarella, pine nuts and basil to salad. Toss, season with salt and pepper. Serve at room temperature. I love all the fresh and summery ingredients in this!